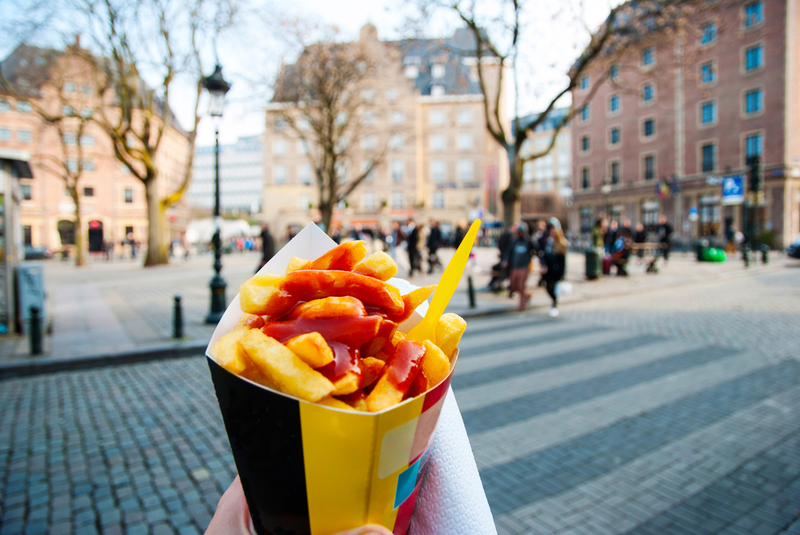 The French claim they invented them, but so do the Belgians; regardless, nearly everyone agrees that fries, also known as chips, are a delicious, savoury snack – the perfect accompaniment to a burger, or just great on their own. When in Brussels make sure you hear one side of the story and head to one of these top friteries to get a taste of this national dish. Their golden, melt-on-your-tongue potato sticks mean Frit Flagey is often titled (along with several others) the best place to find fries in the city. Unequivocal evidence that these fries are delicious is evident from the amount of support for a 2011 Facebook campaign, which saved Frit Flagey from shutting down. It’s success meant the owner of the friterie instead just moved to another place, and its loyal customers duly followed. Make sure you visit to see what the fuss is about. Another friterie that claims the number one spot, Maison Antoine, provides big portions of fries, all crispy on the outside and soft on the inside. Bonus? Most of the bars surrounding Maison Antoine allow the fries to be eaten on their premises. The queue will be long, but don’t worry, its length just illustrates how much people love this place and your purchase will be well worth the wait. A philosophical question, and maybe a tip for discussion while standing in line: is it still fast food when one has to wait 45 minutes? Even though this place is not right in the heart of the city, lovers of fries have found it, so unfortunately the queues may be similar to those in the city centre. This is another place which prepares fresh fries from scratch, making them perfectly crispy. During sunny days, you can sit in front of the fritkot and enjoy the atmosphere while pulling from their paper cone, one salty fry after another. At Friterie du Café Georgette, their secret recipe to preparing tasty fries is to fry them in three different oils, each heated to a different temperature. The service is also really professional here and they are located close to the center of town so you don’t have to detour to find great fries. Order a Belgian beer to pair with them and a special sauce called georgette for dipping. After a few beers during a late night of partying in the city, fries are always a great snack for when the celebrations come to a close. But where to go when it’s already 3am? Luckily, the existence of Friterie de la Barrière means it’s never too late to halt your hunger with fries. This place is famous for being open until 5am, sometimes it even makes it to 7. The fritkot is a traditional-looking, dark old-school shed – you’ll find it if you follow the fragrance when it’s late at night. Some fries are so tasty, that making a long trip is worth the effort. The fritkot Chez Eugene in Uccle is not as popular as other places in the center of Brussels, which may be appealing for those more impatient. It evidences that great fries speak for themselves – it’s owners don’t use social media to market the kiosk, but it still has a solid reputation, making it truly an authentic fritkot. Right in the heart of city centre, near Bourse, there is the fritkot Fritland. This place is no newcomer to the friterie scene, having been in business for at least 40 years. It must be said, there are not many places in Brussels that avoid using frozen fries, but Fritland is one of them – they receive new potatoes daily so guests know that their fries are fresh. An eco-friendly fritkot in Uccle, this place has been in operation for more than 20 years. Its popularity is no surprise as it was created by Clémentine, the daughter of Maison Antoine’s founder, and it’s obvious that these two places share more than just a recipe for success. Pair the fresh fries with one of their hamburgers and you have a match made in heaven. In Brussels, it’s probably a rule that where there’s a great fritkot, there’s a huge queue. However, a positive to this is that it does mean you will always be able to spot the best places from which to buy fries. It’s a rule that holds true for Friterie Tabora. There’ll be a long line, but be patient because it will lead to some of the best, hot, crunchy, golden delicacies in the city. At Fritkot Bompa, the owner guarantees that fries are made from local potatoes and cooked in beef fat. Having been in the business for 45 years, it is obvious that the owner is crazy about fries. Why else would he have a tattoo of fries in a paper cone on his shoulder?